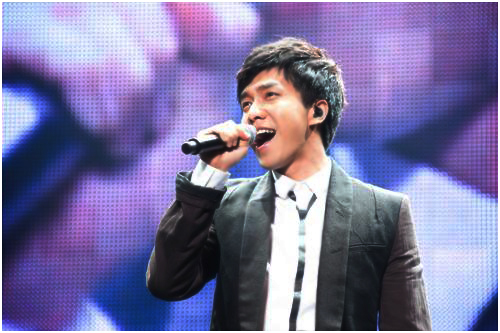 Hallyu singer and actor Lee Seung-gi held his first solo concert in Japan titled "2012 Lee Seung-gi Japan First Live - Hope" on June 1st. Lee Seung-gi made a successful debut in Japan, ranking number one on the Oricon Daily Chart with his debut single "Time for Love" which was released in March. His first concert comes just three months since his Japanese debut, setting a record for the shortest time to achieve the feat among Korean singers. He opened the first act of the concert in front of some 8,000 fans with his hit song "Aren't We Friends". Lee Seung-gi thanked his Japanese fans by saying, "It's a heartfelt stage at Budokan, this is all thanks to you". Japanese actress Riisa Naka who was featured in his Japanese debut song 'Time for Love' also came on stage and stated, "You're an amazing performer at close range. I am not officially a fan". Lee Seung-gi asked his fans which songs they wanted to hear the most and they shouted "Slave". He heated up the stage with an up-tempo performance of "Slave" and "Tonight". He then mesmerized the audience with his soothing ballads, "Let's Break Up" and "I'll Give You My All". He promised his fans that he would return to Japan saying, "I'll sing with all of my heart so that every single breath I take and melody I sing can resonate in your hearts". He ended his solo concert at Budokan that lasted over two hours with an encore performance of "Because You're My Girl". Lee Seung-gi's Budokan concert will be broadcastes on Japan's largest satellite broadcasting station WOWOW on July 15th.